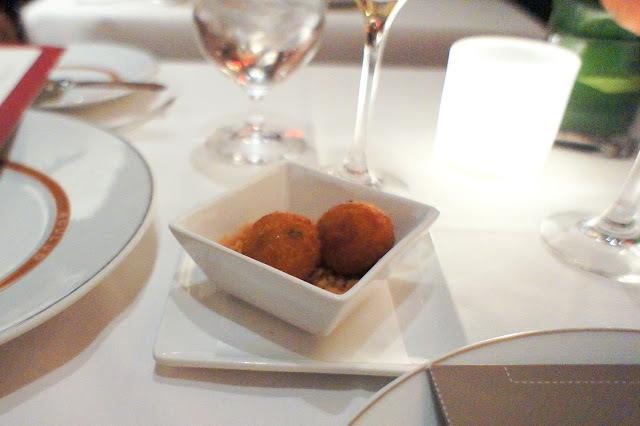 We initially didn't plan to eat at Cafe Boulud. 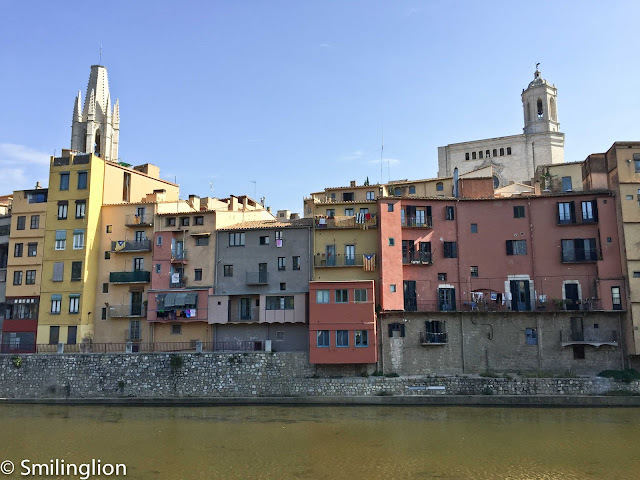 Despite it being a one Michelin star restaurant and located on the next street to our hotel (we walked past it every day during our 2 weeks in New York), we didn't quite fancy eating at a 'cafe' style restaurant. As it turned out, we couldn't have been more wrong. 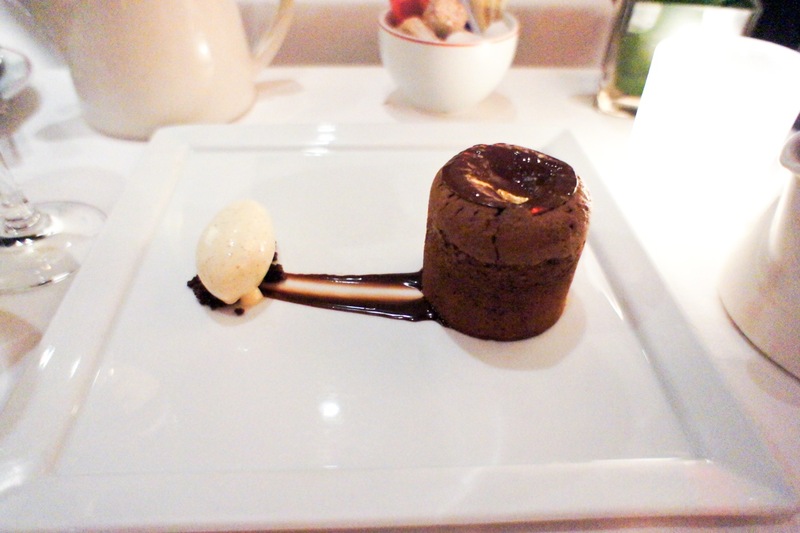 After we failed to secure a reservation at Kajitsu that week, we decided to try get a reservation at Cafe Boulud on our last night in New York (we were feeling lazy and Cafe Boulud was just next door anyway). Moreover, we had just eaten at Daniel, and after having been wowed there, we were actually looking forward to seeing if Cafe Boulud could match up. 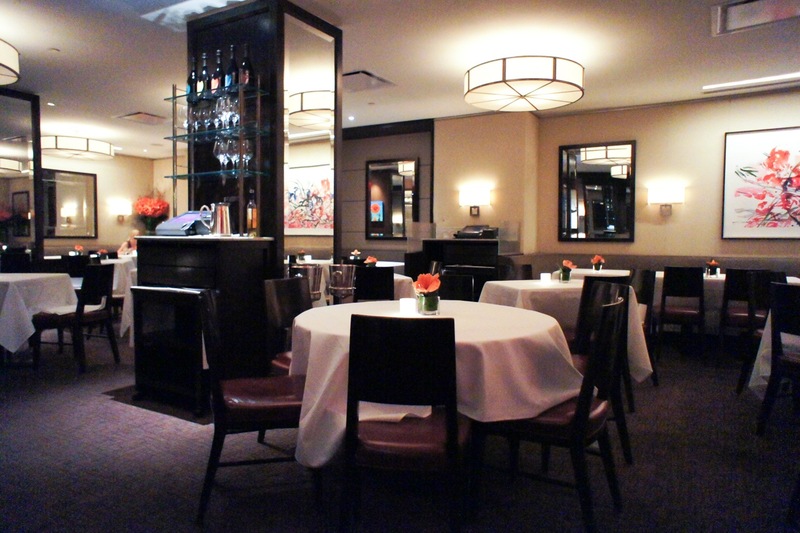 The restaurant is located in Hotel Surrey on the Upper East Side off Madison and Fifth Avenue. 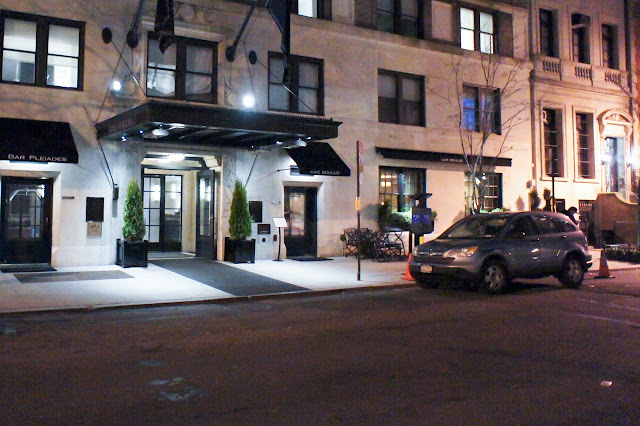 It is housed in Daniel's old spot, and entrance can be via the hotel lobby or through a side door from the street. We were surprised by how the decor was similar to that of Daniel, from the type of lights used and the various artworks adorning the walls (nothing 'cafe' about it at all). It was a Wednesday night and we were also rather taken aback by the type of clientele in this 'cafe'. It was a very senior and moneyed crowd that night. We didn't just feel like we were the youngest diners there; there was a distinct generational gap between ourselves and all the other silver-haired guests. We were given a table which was quite small and had to sit right angles to each other (similar to our seating at Le Bernardin), and our table was quite close to the table of four next to us. The stand-alone tables were quite well-spaced and it was only those along the side of the restaurant which were quite cramped. That said, once we settled in, we were reasonably comfortable. We were served the same champagne as we had in Daniel (the Bruno Paillard champagne specially labelled for Daniel) which was very good and an amuse bouche of deep fried crispy cheese balls. We ordered a bottle of 2008 Premier Cru Gevrey Chambertin from Hubert Lignier which was deep and rich and was wonderful with the beef short ribs. 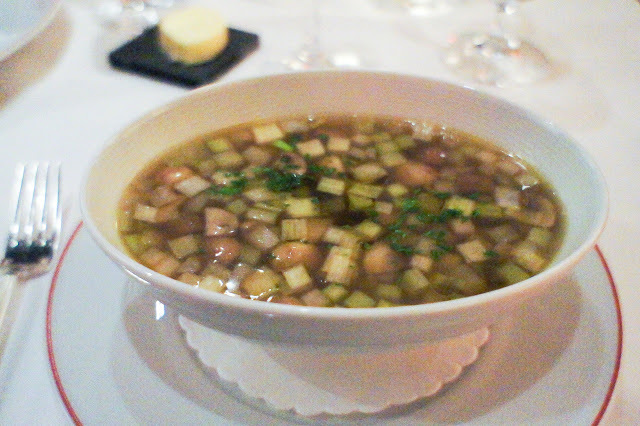 Wild mushroom and barley soup - olive oil, carrots and Italian parsley: Surprisingly refreshing (I was expecting something creamy). It tasted more like a consommé or a minestrone than the typical mushroom soup. Was very nice with the bread. 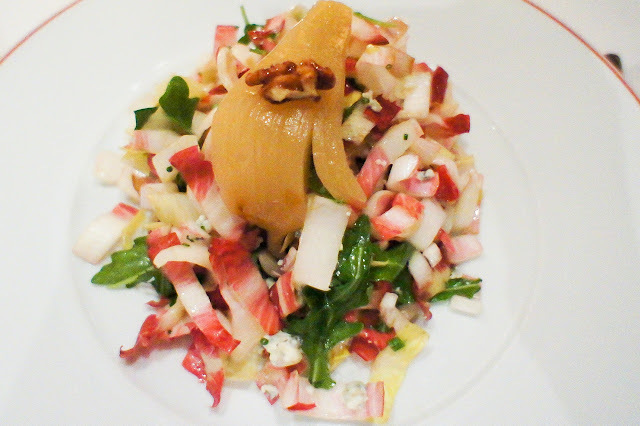 Belgian endive salad - poached pears, toasted walnuts, blue cheese and sherry vinaigrette: The endives were really crunchy and fresh and the flavours of this dish were very well balanced and not too acidic. Steak tartare - quail egg, frisee, cornichons, toasted brioche: The raw beef was very good but what made the dish exceptional was the toasted donut-looking brioche which was the perfect complement of the meat. Slow braised beef short rib - pommes rosti, glazed baby beets, horseradish and sauce bordelaise: We both had this main course. Nicely put together and very delicious. 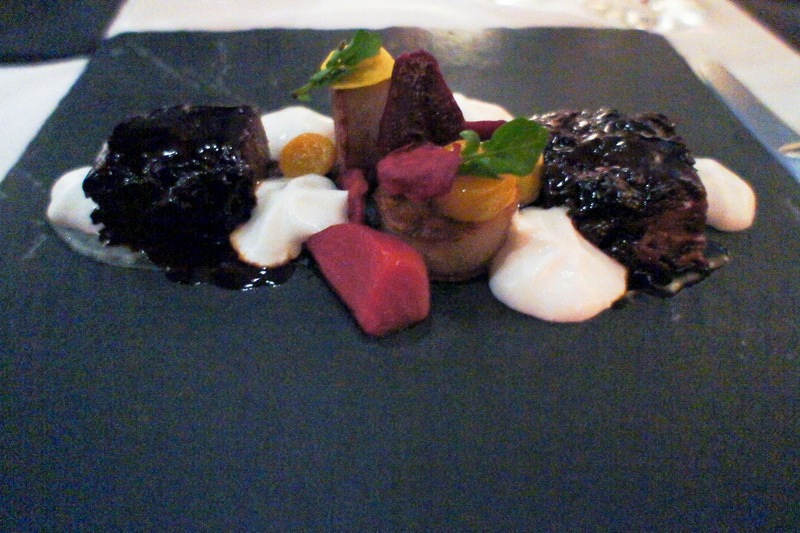 The beets and horseradish contrived to draw away the understandably rich and sweet taste of the red wine sauce on the short rib, mitigating what would otherwise have been a very heavy dish. Black forest cake: Simply to die for. I cannot even remember what it was accompanied by. But it was really good. 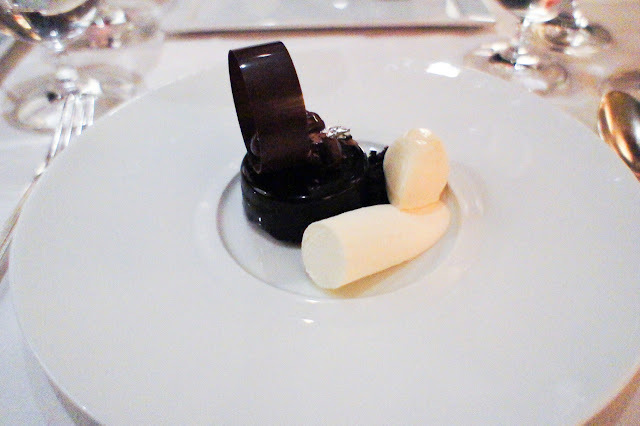 We are ashamed to state that we forgot what this dessert was either. We were probably too drunk by then to remember anything, except that that dessert was exquisitely good. Molten chocolate cake - vanilla ice cream: This is a classic Cafe Boulud dessert (and was not dissimilar to the one we had at Daniel) and was complimentary, which was very nice of the restaurant (not sure why, perhaps we looked like we could do with another dessert!). It was perfectly done. 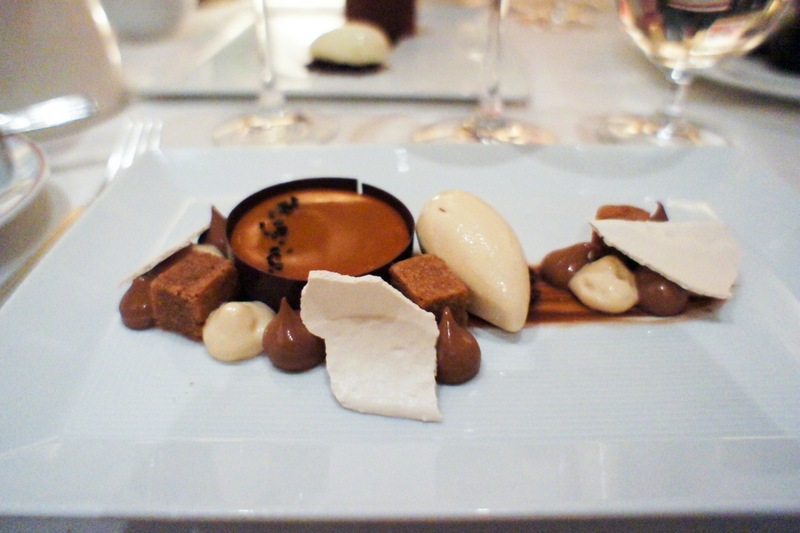 Final Thoughts: Boulud again did not disappoint. 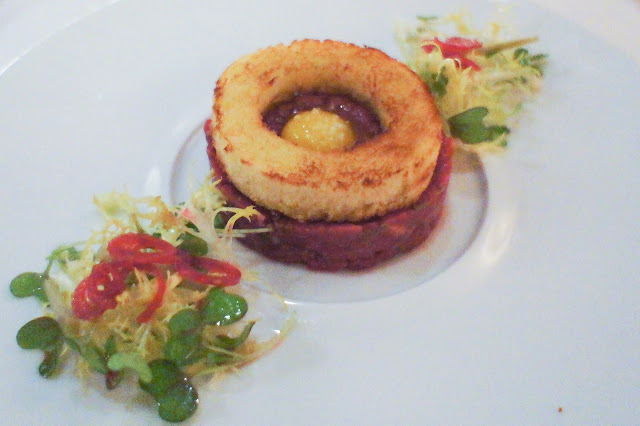 Like Daniel, Cafe Boulud delivered a very flawless meal in the best of the French fine-dining traditions. Service was impeccable and despite us feeling slightly strange in the roomful of really old and formally dressed diners, the staff members were both friendly and warm (and the free dessert didn't really do any harm to our impressions of the place as well).